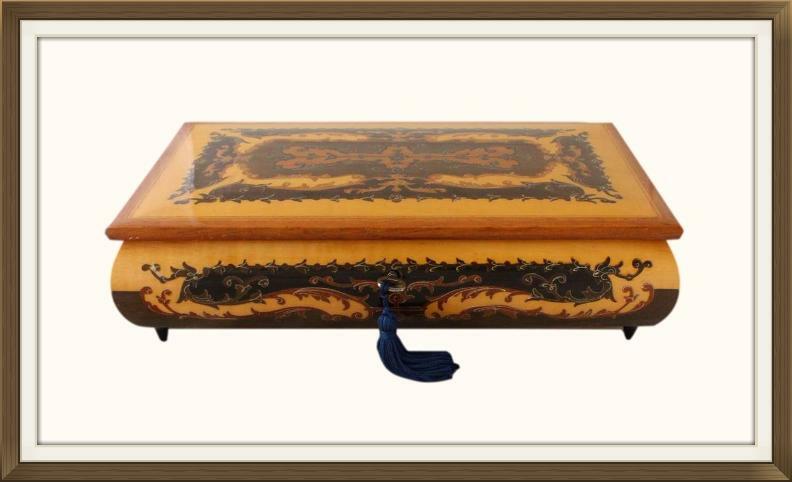 This is a beautiful vintage musical jewellery box, made in Sorrento, Italy. It dates to the 1960s/70s and is in very good condition. The box is a good size and has a roomy storage compartment. 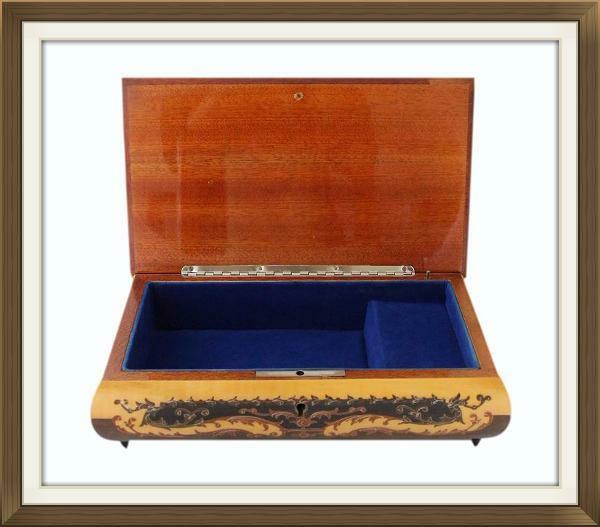 The box is made of satinwood and has beautiful marquetry inlay to the lid and all four sides. 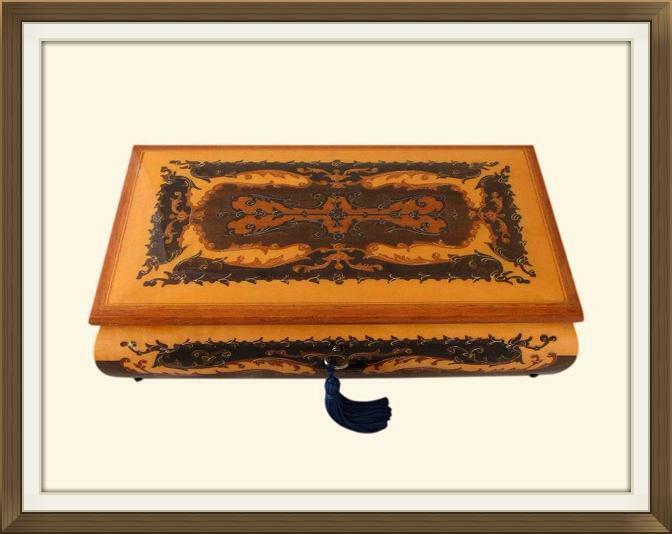 The marquetry is made up of several varieties of wood. The wood to both the exterior and interior has a gorgeous polished and lacquered finish. It has a wonderful sheen and is beautifully smooth to the touch. The box is complete with its original piano 'stop' hinge. This prevents the lid from extending too far back. It stands raised on tapered ebonised feet. 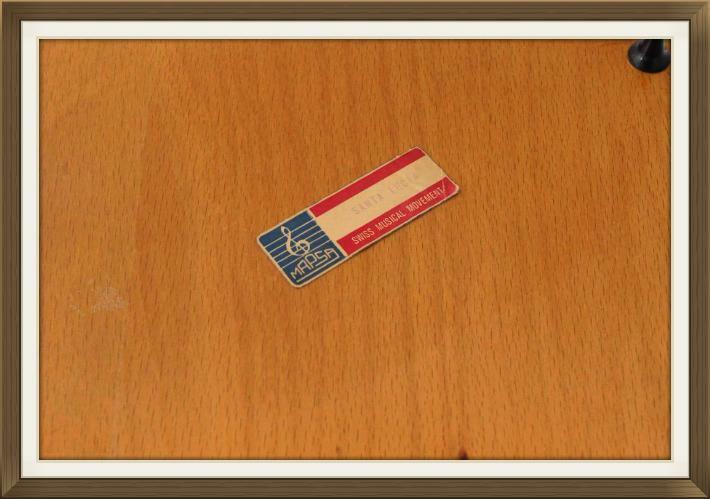 Please note that the lock is not functioning, and that the key is for decorative purposes only. The interior has a single large storage compartment. The musical movement is cased to the right of this and has space above it for further jewellery storage. The compartment has a beautiful blue brushed felt lining, and the same felt covers the casing to the movement. This box has a quality Swiss 'Mapsa' movement. It plays the beautiful tune 'Santa Lucia. This is a traditional Neapolitan song from the 19th Century. The song has since been recorded by several artists, including Elvis Presley for his 1965 album Elvis for Everyone. It featured in the film Viva Las Vegas. Its original lyrics celebrate the beautiful waterfront of Borgo Santa Lucia in the Bay of Naples. The movement is in good working order, playing the tune at its correct speed. The movement winds up via the key on the bottom of the box. Eight turns of the key are sufficient to play the tune in full. The music stops playing as it should, when the lid is closed or when the movement has fully unwound. As with all musical boxes, care should be taken not to over wind the movement. Over winding will result in the movement malfunctioning. 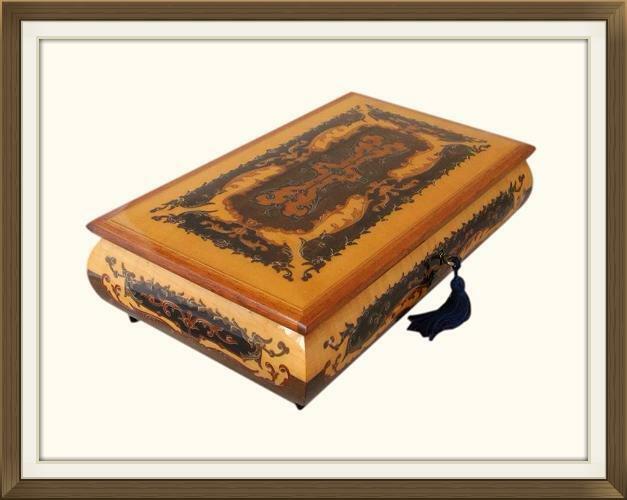 We are not responsible for movements that are over wound or for movements which deteriorate from further age and use, once the box is purchased. Please read our returns policy which includes our policy on musical movements. 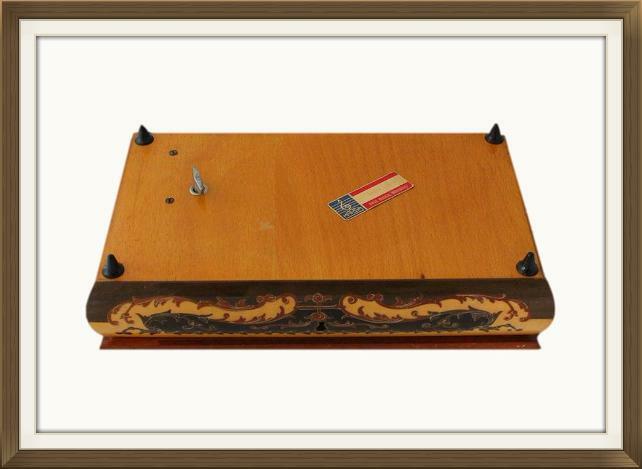 This wonderful box is in excellent condition for its 40-50 years of age. 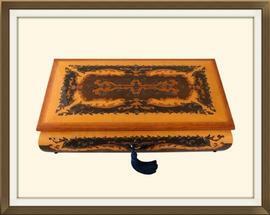 All of the marquetry inlay is present and intact, and the box is structurally sound. There are two minor, barely visible, hairline cracks within the lacquer on the lid. These are completely superficial and there is no damage to the wood beneath. The interior felt is in excellent condition with very little wear. The hinge is in perfect working order. 16.3 by 12.3cm with a 4.3cm depth. This box will be posted FREE within the UK, by Royal Mail Next Day Special Delivery. International postage is by Royal Mail International Tracked post. Delivery is fast, within 3-5 working days to Europe, and 5-7 working days to the rest of the world.